Depend on Davey to offer a great looking, energy saving home pressure system with gold level performance! 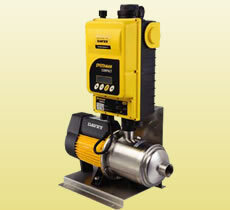 Davey’s Speedman Compact offers constant pressure and up to 50% power savings over traditional fixed speed pumps. Speedman Compact’s variable speed controller offers the home owner or end user the ability to easily set the pump discharge pressure to suit (within the pump’s capabilities). This can even be set as high as 750kPa (108psi) where boosting incoming pressure, such as mains supply. By adjusting pump speed to suit the flow and pressure needs, Speedman Compact can offer significant power savings over constant speed systems. The Speedman Compact allows for power savings by allowing the adjustment of discharge pressures down. Not only can you save power at your normal pressure level, you can save even more power by dropping the constant pressure setting – 25% pressure drop = 20% power saving! Lower the Noise – Doesn’t that sound good! Because Speedman Compact in a home supply situation is likely to be running well below maximum needs, it’s also very quiet. The Speedman Compact motor also has a special super quiet design that makes it even quieter. Speedman Compact is designed for ease of installation and use, it’s ready to connect water, plug in, and switch on!